The video may take a few seconds to load (make sure you've got your speakers on!). Click here to go back. We've probably not met before, but I think we share a common interest. Perhaps you've tried autoblogging before. Maybe you're looking to get traffic for a product you own, a client's site - or drive traffic as an affiliate. I don't know. What I do know is you've arrived on this page because you're serious about getting more traffic, links & profit from your sites. So I can guarantee that you'll find this page very valuable to your current (or future) business. Ever wonder why some blogs (usually other peoples!) mysteriously pull in 1000's of daily visitors, whilst others struggle getting a few bot hits? Have you setup a decent autoblog before, but getting it to make money is like getting blood from a stone? Do Google's quarterly SEO air-strikes depress you? Even when you get a few blogs running, does link building always seem like an uphill battle? Does the time it takes to get a blog up & earning frustrate you? You ever wonder if there's a quicker way? 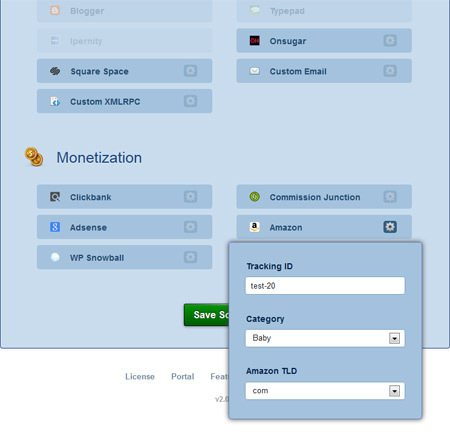 Are you tired of the same old, low-grade, poor-performing autoblogging plugins around today? I'd bet that figure is even higher with autobloggers, because there are some unique challenges. Why do you think most people most fail miserably at autoblogging? I mean, the Internet's a big place - surely there's enough traffic and conversions out there for us to get some profitable autoblogs up and running? "I've tried autoblogging, but saw pitiful (if any) results"
You spent the time to learn the latest software that guaranteed to change your life. You put up with the bugs, slow support, and you even tweaked all the posts manually. But the traffic never came. All the content was duplicate, you had close to a 100% bounce rate and you even started getting DMCA notices because of the content on your blog! After admitting that it didn't work for you, you put the idea on the back burner. 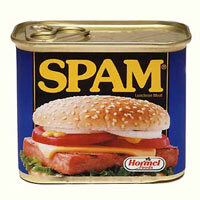 "Autoblogging seems like spam to me"
I completely agree. What most people think of as autoblogging is complete garbage. Throwing up some auto-poster of dupe content built 5 years ago is *not* the way to do autoblogging today. It plain doesn't work. Google got wise to it a long time ago, and there's 1 very specific reason for that. Google has 2 priorities. Number 1 is their AdWords profit. That's the company's golden egg. And for Web Search, the number #2 is user experience. And that means giving people results that match the intent of their query. So if you just throw up some old autoblogging plugin posting dupe content - it's not helping anyone. Can you honestly imagine someone landing on an autoblog full of low-grade, fluff articles and liking it so much they stick around? However, there's nothing wrong with automation. It's what the largest businesses in the world are built on. So it's just a case of combining the two things - user experience, and automation. Is that really that possible? "I'm making money, but always looking for new traffic sources"
You've got a few income streams, but realize that how much you make is limited by how much targeted traffic you can point towards your products and offers. You've pretty much exhausted (or given up on) the standard free methods, and usually stick to the paid traffic sources as they're more reliable. "I'm new to autoblogging, but looking to make some extra cash each month"
You've already got a day-job, but long term you want to have your own business. Recently you're finding it tough to find time for SEO, blogs and affiliate work, so you really need a shortcut to a reliable, extra monthly income stream. I was being offered cake at my Nephew's birthday party. He was 3 at the time and had way too much energy. , hoping to get back some of the glory days when traffic came easy and everyone clicked on ads. Ideas kept popping into my head, so I grabbed a napkin and wrote down the common sense way to get real results. I wanted the content to be unique, without having it garbled by some spinner. There's (maybe) 1 half decent spinner available, but I didn't want to be tied to some API limit. It would mess everything up if I could only make a handful of posts per day. It needed to have lots of fresh, unique, effective twists to the usual autoblogging idea. I knew I wasn't going to get anywhere by doing the exact same thing 10,000's of low quality blogs were already doing. It needed to have lots and lots of content sources. Half the problem with other auto-posters is they're inbred, all posting from the same small handful of sources. You think Google doesn't notice these things? If I'm setting up a small army of blogs, I don't want to be building links to them all as well. I needed a multi-month link building campaign scheduled for every post. This new invention would need a Clickbank, CJ, Amazon, and AdSense for starters. I needed enough scope to test different monetization sources with different niches to maximize the commissions. The ads should be fully automatic, relevant, and need to look the part on my blog. Apart from all the usual settings (crediting content if required, link cloaking, auto-formatting keywords etc) I would need it to go further. For example, it needed to carefully manage bot clicks on the affiliate ads. Some affiliate programs don't like you sending bot traffic as it lowers your EPC (Earnings Per Click). This is probably THE problem with current autoblogging solutions. I needed something that had a solid content system, with fail-safes in place to ensure only relevant content got posted. I used these 8 points to come up with a system. A new way of autoblogging that couldn't fail - because it was giving both Google AND users what they wanted. What's the average affiliate commission? It's a how long's a piece of string type question, I know. But I had to make some assumptions to estimate the success of this idea. So if we take digital cameras from Amazon, for example. In this case traffic converts with Amazon at around 5% and you make $10 per sale (I know - I've got a digital camera blog doing just this). And let's say we want each blog to make, on average, $3 per day. So each blog needs to make 1 sale every 3 days (or 10 sales a month). Now, how much traffic would we need to to do that? I've been getting 1-3% CTR from my blog to Amazon, so we'll be pessimistic and call it 1% for now. First let's work out how many visitors we'd need to make 1 sale, then we can plan how much traffic we need per day to make this work. 2000 visitors would get 20 ad clicks to Amazon (1% CTR) which would make 1 sale (at 5% conversion). So 2k visitors gets us $10 commissions from that 1 sale. And 2,000 visitors divided by 3 days (our target above) means that a blog needs 666 daily visitors to make $3+ per day with Amazon. When you get this far - you simply setup another blog, in the same niche (to start with) with a slightly different keyword focus. 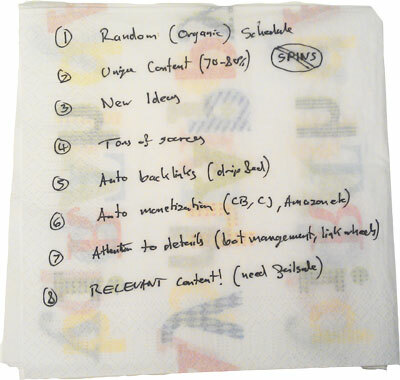 And with this 8 point napkin plan, setting up new blogs would be brain-dead easy. I could do a bunch a day... or even better, if I used WP Multi Site I could have 100 up in no time. 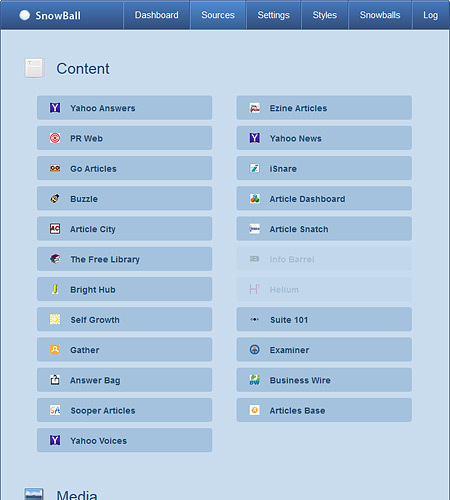 Now I'm not suggesting you could setup 100 blogs in the same niche. My plan was to keep building in the same niche until I saw less results from newer blogs, then build out another niche. That's the higest I've seen so far (you might get higher). 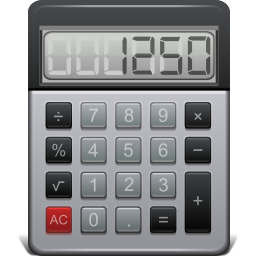 The actual number depends on what settings you use, so you can control it. Optionally display the authors full bio (if there's one available on the article site), or if not uses a link to the article itself. So you're following all the rules, and can relax. Get more unique content with 1 click (which means more attention from Google). However - instead of just producing rubbish, we change very few items, ensuring 100% readability. We let a whole host of other uniqueness features in WPSB work together to get a high percent uniqueness. Relevant content makes your blog more useful for humans, and more attractive to Google. You enter a few niche keywords, and these are used to verify the relevancy of new content, before it goes live. Anything that doesn't make the cut - is blocked. Get a multi-month backlinking campaign for every post on your blog. You simply choose how many links you want, and they're automatically scheduled. Choose how big (Max Levels), and how fast (Max New posts) you want your blog to grow. Doesn't matter if you're Just testing things, have a few niche blogs - or a fleet of heavyweight news blogs - you're in control. 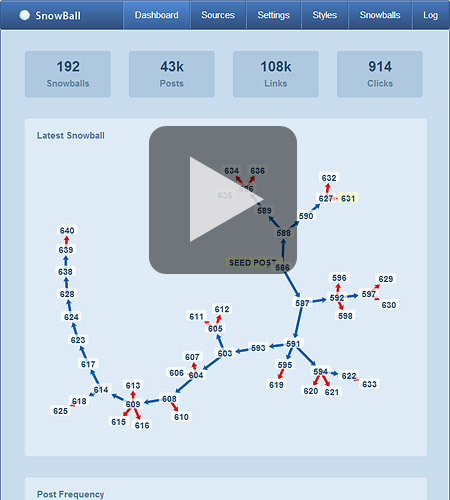 "Styles" are how Snowball links posts together on your blog. 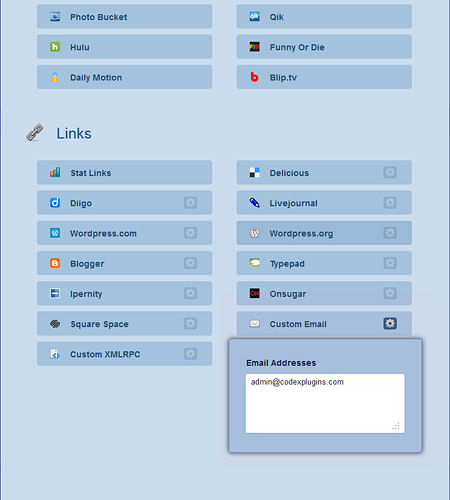 You can pick one of the default ones, or create a new one to perfectly match your blog's theme. Add word definitions from various sites in hover-tooltips in your posts. The extra content is there for Google, and it adds value for humans. A perfect combo. Auto bold and italic important keywords in each article to help Google know the main keywords. Either contain all Snowball posts in a single category (e.g. a "News" category), or auto-use the same category as the post's "parent" post in the snowball chain, for increased topic relevancy. This isn't generic, auto spinning. That would be bad. This lets you write a custom spintax block to include on each post's header and/or footer (the specific spin stays the same per post). 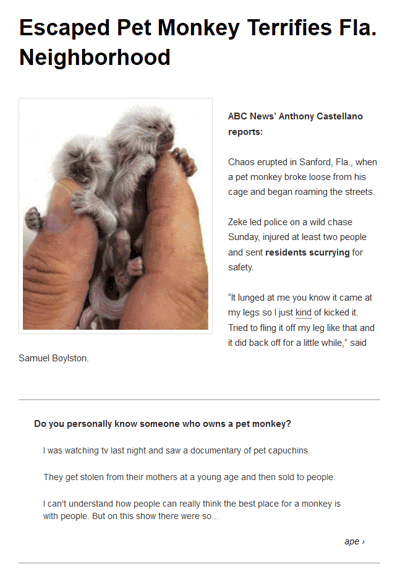 We don't want to overdo the keywords, but most WP titles are severely lacking. WPSB can change your title template to include relevant keywords for Google, in a user friendly way. See exactly when a new Snowball post is made, (and what "Level" it is) on the Snowballs tab. A basic feature, but so many plugins get it wrong. WPSB handles link encryption, blog-specific encoded css, randomized HTML and more - with no footprints for Google to chew on. All your affiliate links are encrypted (to hide you aff ID), and they have built in tamper protection from snoopers. 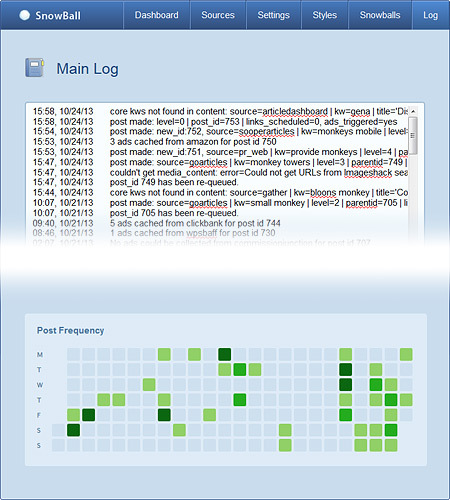 Any WPSB-encoded link click is tracked, and shown per post and overall for the blog. So you can see exactly which affiliate products, ad sources and posts are working - and what to change. A clean, simple interface makes it fun to setup - and see what's been happening. After installing in WP, you just enter some "Core KWs" to ensure your blog's theme is protected, then make a post. WP Snowball takes it from there. No messing around in Cpanel required - WPSB automates all it's scheduling out-the-box. Hover over anything in the plugin and you get a helpful, concise hint about what it does. A real time saver. WPSB does all it's work in the background, so you're never saying "C'mon! Hurry up!" So How Does It All Work, Exactly? 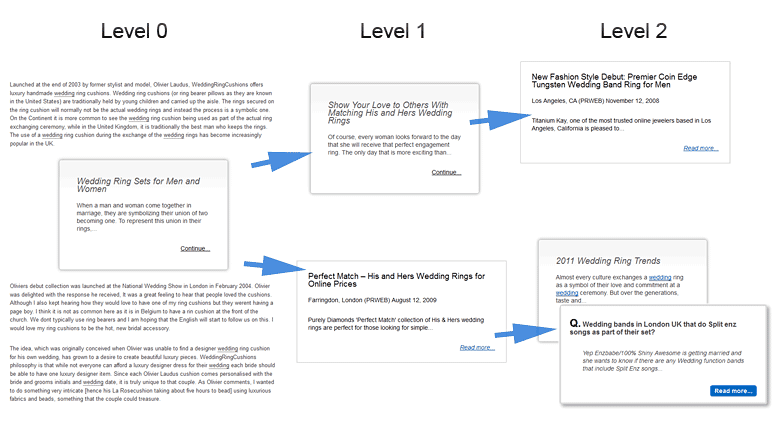 Everything is centered around a new post you (or some other auto-posting tool) makes on your blog. 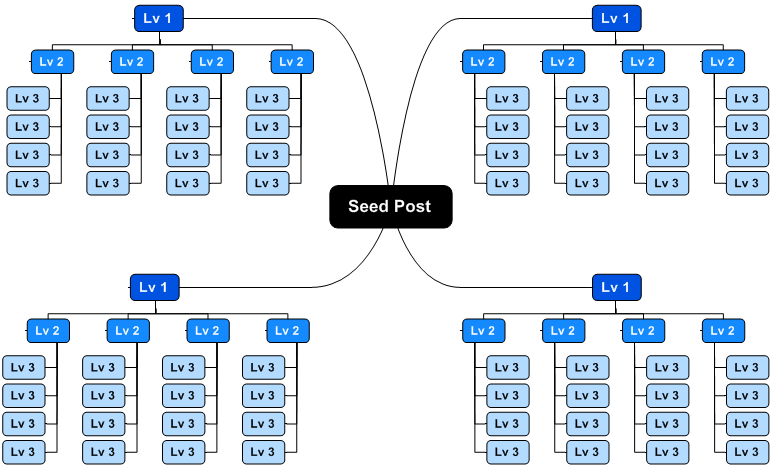 We'll call this a "Level 0", or "Seed" post. Then when a human visitor lands on this post for the first time, the magic happens. In the background (so visitors don't have to wait), new content, images and video are collected about a sub theme found in the Seed Post. These pieces of content are each made into a new WP post... and the seed post contains a link to each of them using one of WPSB's "Styles" (or you can make your own). You see the section at the bottom of the example WP post, to the left? That's a "Style", linking to a child post. That post was generated using a keyword in the main post. And now, when someone clicks on that link - MORE content will be posted, continuing that "Snowball". On the dashboard of the plugin you can see the actual structure, with a dynamic graph (that you can drag around and play with). And the interesting thing is, because there's randomization built in, the structure will never look like the idealized one above. It will be much more natural. How Can I Get WPSB? Shortly after I wrote the napkin and planned WP Snowball 2.0, I was dead-set on a monthly price plan: options from $497 to $97, per month. Products like this really grow and thrive from feedback, and recently the best plugin ideas have come from clients (there's a full feature voting system for WPSB you'll see soon). For good feedback you need more clients, so I felt I had no choice but to make WPSB a one-off investment. 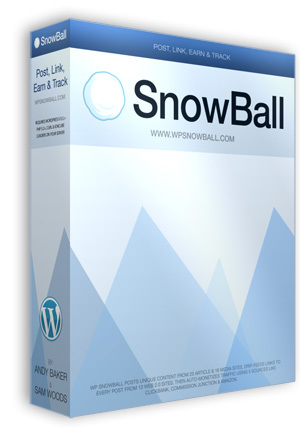 "I want to get in at the ground floor with WP Snowball and start getting hands-free traffic & commissions today. I understand that I also get..."
So click one of the buttons above to get started. I know you'll love WPSB from the first install - and I'll be here if you've got any questions about how to get the most from it.